Bahrain Confidential was invited to witness the partnership of Nissan and Expo 2020 Dubai. Expo 2020 Dubai is joining forces with leading vehicle manufacturer Nissan to demonstrate and showcase the future of intelligent mobility – starting with a fleet that includes electric vehicles. This is the first time in the Middle East that the second generations of the electric car have been unveiled. Nissan LEAF is the world bestselling electric car. Learnings from the partnership will help accelerate the electrification of mobility in the region. Nissan Intelligent Mobility technology will also be extensively showcased at the mega-event taking place in 2020. The World Expo is one of the world’s oldest and largest international events, taking place every five years and lasting six months. It is a festival for all, where everyone can learn, innovate, create progress and have fun by sharing ideas and working together. Over the course of six months from October 2020, Expo aims to bring together hundreds of countries and millions of people to celebrate human ingenuity: ‘Connecting Minds, Creating the Future’. Bahrain Confidential went to the site of where the Expo 2020 will take place. The Expo site is located in the area known as Dubai South, close to Al Maktoum International Airport. The site covers 4.38 sq km and has four main entrances. The Dubai Metro Route 2020 will take 46,000 passengers per hour to and from the Expo site in under 16 minutes from Dubai Marina. Currently, it’s just a busy desert with ongoing construction for the site development. The pace of construction continues to increase and visitors will have to wait to see what Expo 2020 will reveal to the world. There is a countdown clock in the site office above a scale model of Expo 2020. It counts down not just the days and hours, but also the minutes and seconds! In less than 3 years the dusty desert we inspected will be transformed into an iconic 4.38 square kilometer city hosting the biggest and most technically advanced international expo the world has ever seen! What will happen after the Expo 2020? 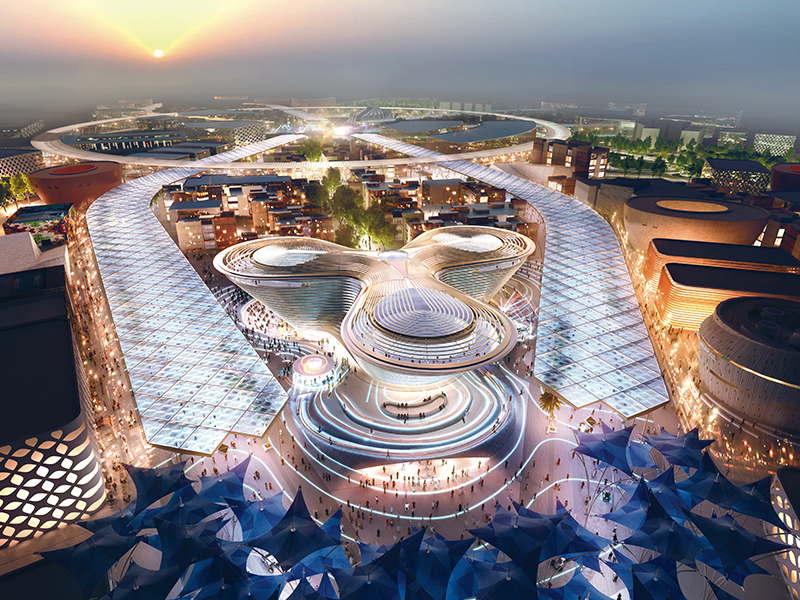 The Expo 2020 will, for the first time, allow all 180-member countries to have a pavilion of its own. What will happen to the 4km long and 1.8km wide site once the expo actually wraps up?